There are many ways that teams 'cheat' in F1 in order to get ahead. Like ordering your driver into a wall, or blocking a corner "by accident." The best 'cheats' don't break the rules, but bend them using technological loopholes. These were the ten most brilliant efforts. Renault&apos;s mass damper. I don&apos;t think this gets enough credit for what it did. Read more about Rob Marshall's genius invention here. The F-duct was simply brilliant. A tiny hole in front of the cockpit gave them superior straight line speed by channeling air to stall the rear wing. Using nonlinear fluidic effects to implement a logic switch for airflow was so smart that the FIA gave it a go as well creating what's known as DRS today. Still, the original was way more interesting. Just click here to see why. Simply everybody was turning those turbos to eleven for qualifying, but only BMW could get close to 1,500 horsepower out of 1.5-liters. How? Well, since there were no engine limitations, it was okay to blow up engines after completing just four laps. Four very fast laps. They simply put a new one in for the race. Let Jackie Stewart explain it to you while wearing a cowboy hat. Gotta love the eighties! Formula One cars all must meet a minimum weight in the name of safety and performance. Tyrrell figured out a way around the rule to make their car lighter and faster on the track. You picked exactly the one I would have suggested, Rafa. Tyrrell's 1984 car actively racing underweight only to have the water injection system topped up with 2 gallons of water and 140 pounds of lead shot at the end to make minimum weight for the post-race inspection. A clever way to do it given that Tyrrell was not a huge economic power in F1 and their car was I believe one of the few non-turbo cars of the era. Formula 1's rules explicitly stated that a rear diffuse could only be so big, but Brawn F1 managed to contour the whole shape of the car to act like there was a second 'double decker' diffuser area stacked on top of the one the rules intended. Other teams protested it was illegal, but it was so effective that it practically secured Brawn the championship. Use Honda's money to develop an innovative new car. Buy the team for one pound once the Japanese got fed up with Bernie and all. Win everything while the rest tries to catch up spending millions in the process. I believe they figured that you'd save almost a second of lap time with a CVT. Why? First, those .050s shifts add up. Second you are ALWAYS in the correct gear to give the most available power at all times. Even with 7 or 8 speeds, you still wind up not being at 100% power at all times, something a CVT will do. The 88 used an ingenious system of having a twin chassis, one inside the other. The inner chassis would hold the cockpit and would be independently sprung from the outer one, which was designed to take the pressures of the ground effects. The outer chassis did not have discernible wings, and was in effect one huge ground effect system, beginning just behind the nose of the car and extending all the way inside the rear wheels, thereby producing massive amounts of downforce. The original MP4/12 had one pedal too many. McLaren was eliminating understeer and wheel spin in any corner quite efficiently until photographer Darren Heath discovered the trick. We don't know if Red Bull have given Vettel his fourth championship with the help of traction control or not, nor if Michael Schumacher started his winning career by cheating or not. All we know is that the hardware was there, the software was there, and the team boss ordered his second driver into a wall 14 years later just to win a race. Designed by the legendary Gordon Murray, the Brabham BT46 was literally sucked to the ground by a huge fan stuck on the back of the car. Other drivers complained that the fan picked up stones off the track and shot them at following cars. It won its first race, and it would have won many more, but Brabham agreed to give up the technology after months of development for the sake of the sport. The fan car was too effective, too out-of-the-box for its own good. Brabham BT46 Fan car. An even better example of Gordon Murray&apos;s brilliance, imo. 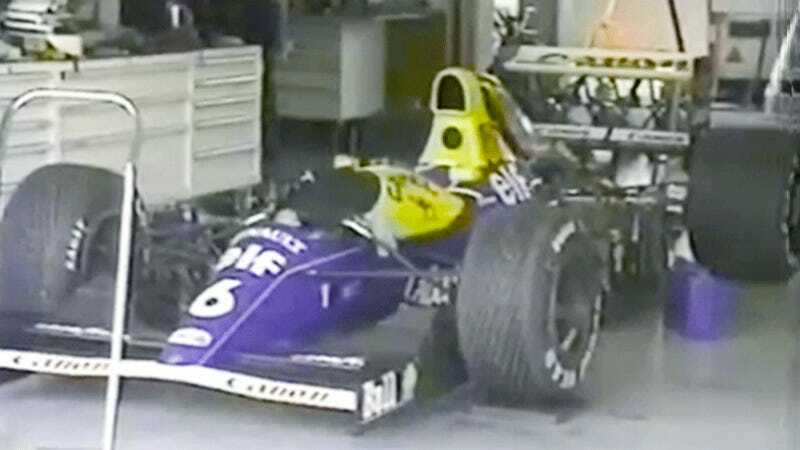 What&apos;s The Most Ingenious F1 Cheat Ever Implemented?